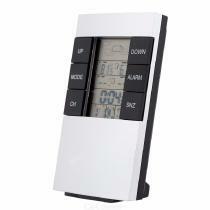 Features: Measure indoor and outdoor temperature and humidity. Wireless transmission makes it possible for outdoor temperature to display on the indoor receiver. Remote transmission of outdoor temperature by 433MHz. Multiple functions: alarm, snooze, calendar, weather forecast and moon phase display. 2 temperature units: Celsius(°C) or Farenheit(°F). Suitable for garage, office, garden or living room use.